JAMF Software has long had 0 day support for new Apple releases. The latest version of Bushel allows you to enroll El Capitan devices. Casper 9.8 also allows you to enroll devices. There are certainly going to be subsequent updates that allow us to do even more. 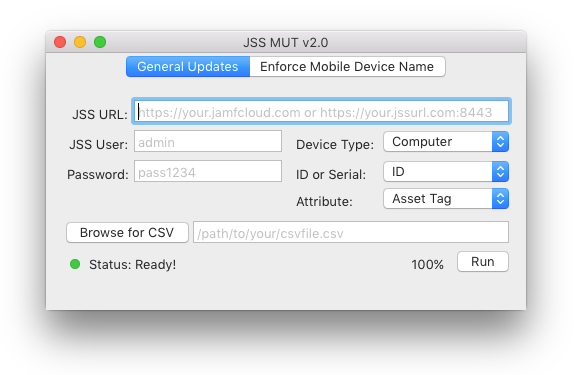 This was a tricky one, as the jamf binary had to be moved and there were some new enrollment policies, to keep your Apple devices as secure as possible! Bushel is SaaS, so it’s available today. Casper should be updated. You can access our installers using your My Assets page on JAMF Nation. Happy updating! JSS-autopkg-addon Presentation from Allister Banks on Vimeo. (Guest post by Allister Banks) On June 26th, I had the pleasure of being invited by @Tecnico1931 to the NYC Metro JAMF user group meeting. A worksheet I created for this event may be found here: url.aru-b.com/jssAutopkg See also Shea Craig’s python-jss, and thanks go out to James Barclay, Sam Johnson, and all the folks mentioned in the video. (Guest post by Allister Banks) Working with modern tools in the ‘auto'(dmg/pkg) suite, it sure reinforces the old chestnut, ‘it’s turtles XML all the way down.’ The thing that struck me when first diving into using autopkg was that different product recipes could potentially have a good amount of similarities when they share common processors. One example is drag-drop apps that can be discovered with an ‘appcast’ URL, which, in my recollection, became common as the Sparkle framework gained popularity. This commonality is exactly the type of thing sysadmins like myself seek to automate, so I built a few helper scripts to 1. discover what apps have appcast URLs, 2. generate the base download recipe, and further, the 3. pkg-building recipe that can use the download recipe as a ‘parent’, and the 4. munki or JSS recipes which can nest the pkg recipe in it. Recursivity is the new black. Please do take a look if you feel you’ve got apps that folks haven’t built recipes for yet, and laugh at/use/fork my code as you see fit! 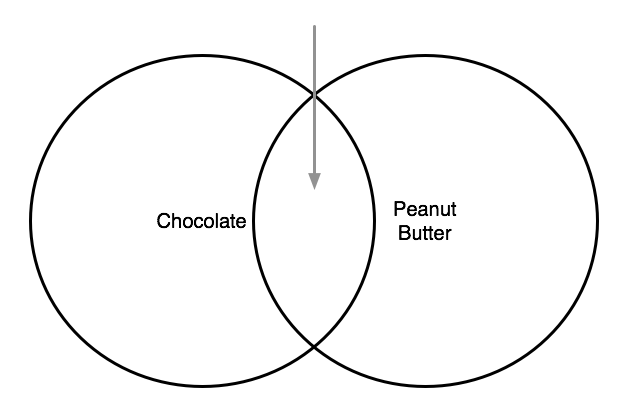 As Venn diagram circles go, many folks in our community are getting into autopkg, and there’s even more that already use the JAMF Casper Suite. Over on the 318.com blog there’s an announcement for a new ‘processor’ add-on that can be installed with autopkg, that therefore can leverage the JSS API to fulfill many of the functions which up until present only Munki enjoyed. Please do read the release notes and give it a try! Open the web interface for the JSS. 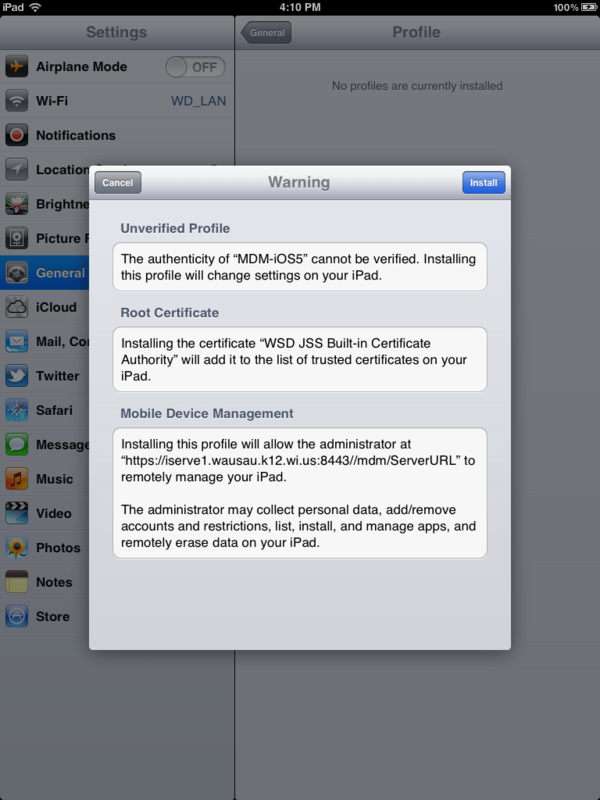 When prompted to trust the certificate, click on the disclosure triangle and then the checkbox to trust the cert, providing the administrative credentials when prompted. Click in the search field. Control-click on the name of your server’s “Built-in Certificate Authority” entry. Choose the option to Export. When prompted, provide a name for the certificate in the Save As fiel. Choose a location to save the certificate to using the Where field. The .cer format is sufficient for our purposes. Log into the web interface of the JSS. 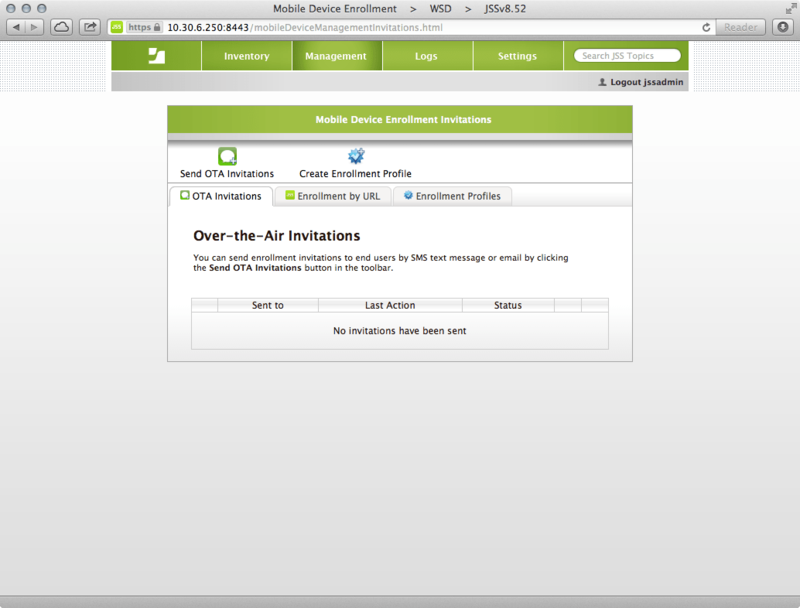 At the Mobile Device Enrollment Invitations screen, click on the Enrollment Profiles tab. Once the profile is downloaded, it will automatically attempt to enroll the computer you are downloading it from in the Profiles System Preferences pane. Click on the downloads link in Safari. 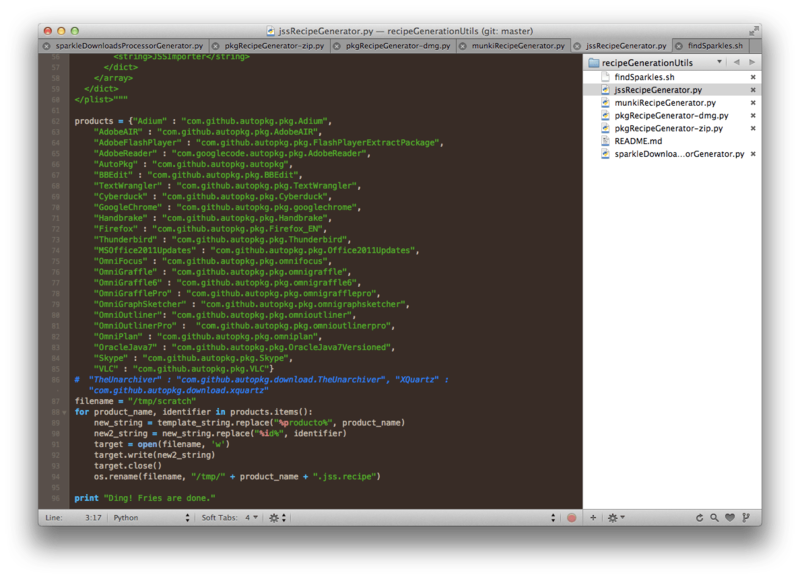 Click on the magnifying glass icon to see the .mobileconfig file. 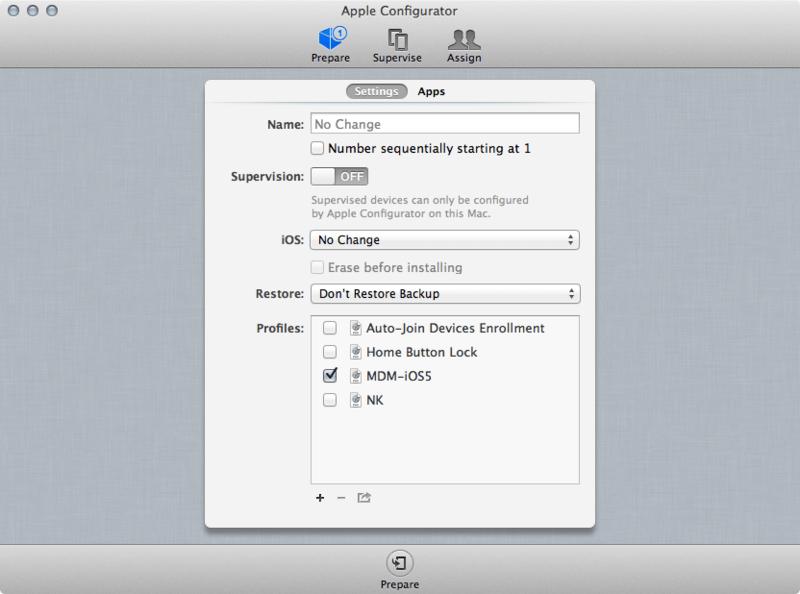 Open Apple Configurator on the client computer. Click on Prepare in the row of icons along the top of the screen. 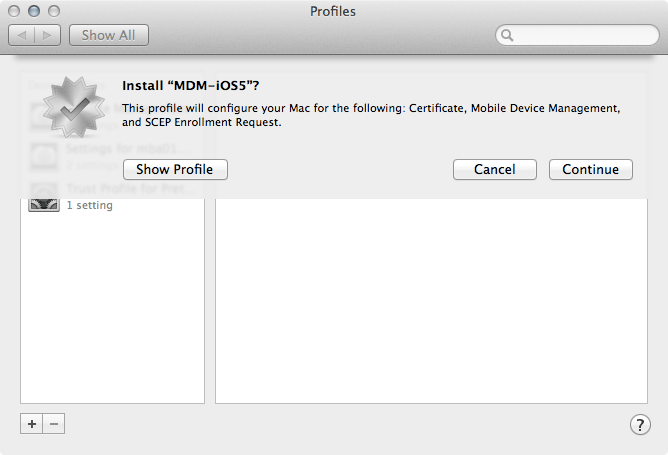 Drag the profile (by default currently called MDM-iOS5.mobileconfig) from the Finder into the list of Profiles. 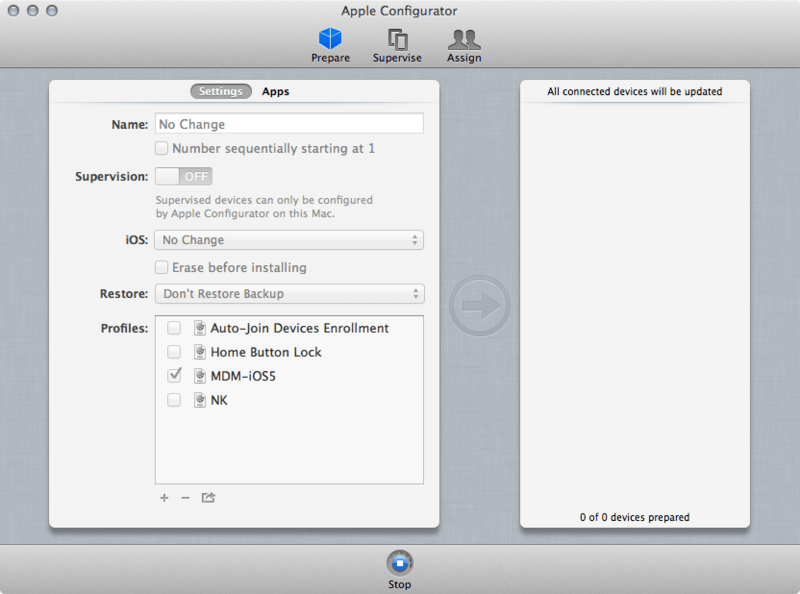 The profile then appears in Apple Configurator (in this example, called MDM-iOS5). Set the name to be blank, numbering should be disabled, Supervision should be off, iOS should be set to No Change, “Erase before installing” should be unchecked, Don’t Restore Backup should be set in the Restore field. 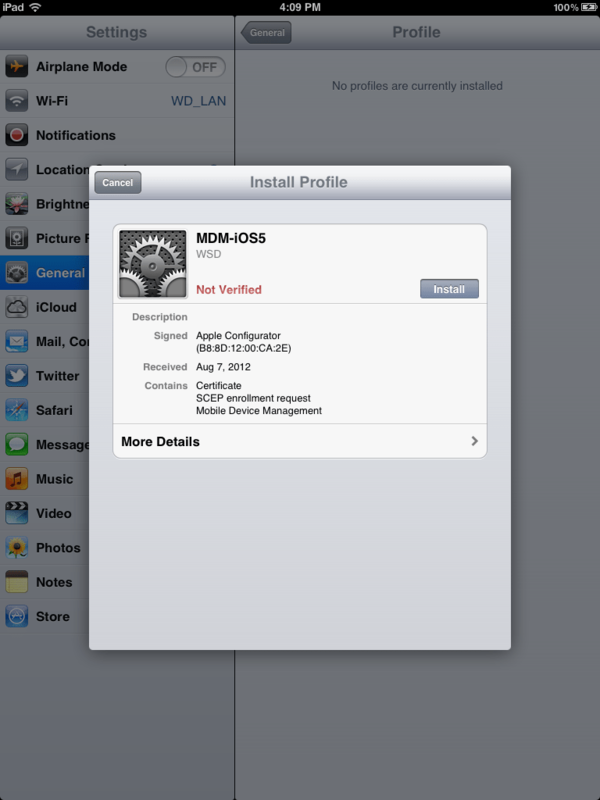 Check the box for the newly added profile (MDM-iOS5 in this example). Click on the Prepare button. 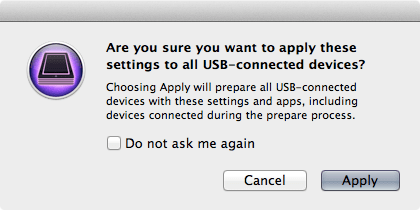 At the “Are you sure you want to apply these settings to all USB-connected devices?” screen, click on the Apply button. 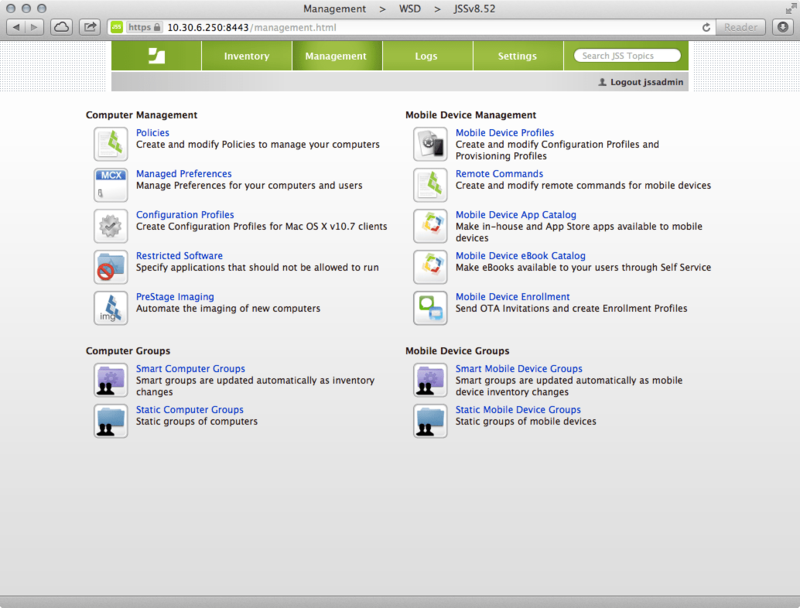 The subsequent screen shows when devices are being configured. 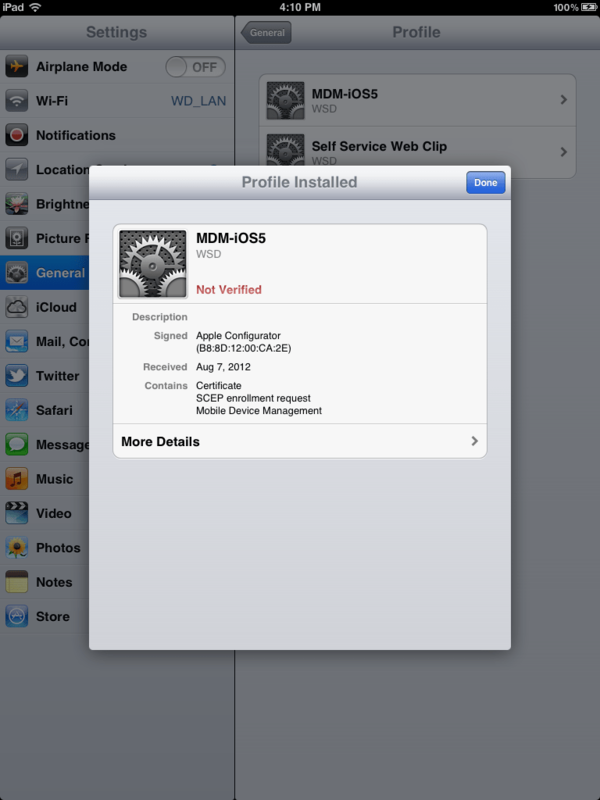 Here, dock the device to receive the profile (note, all docked iOS devices are going to be configured with this profile). 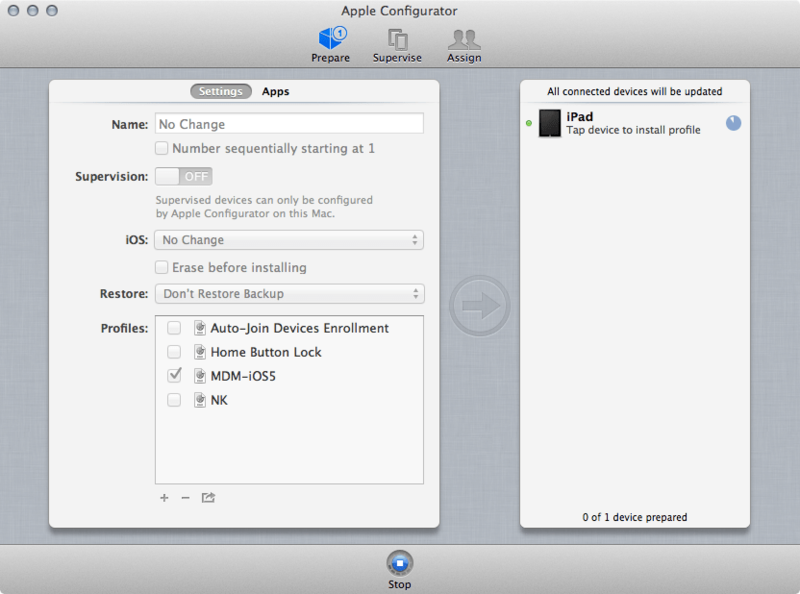 Once the device is connected, the profile will begin to install. You are then prompted to “Tap device to install profile”. On the device, tap on the Install button. At the Warning screen, tap Install. Once the Profile is installed, tap Done. You have now been enrolled. If you then wish to unenroll, simply remove the profiles by tapping on profiles and then tapping on the Remove button. Per the MDM API, a user can elect to remove their device from management at any point, so expect this will happen occasionally, even if only by accident.